It’s time for a classic. 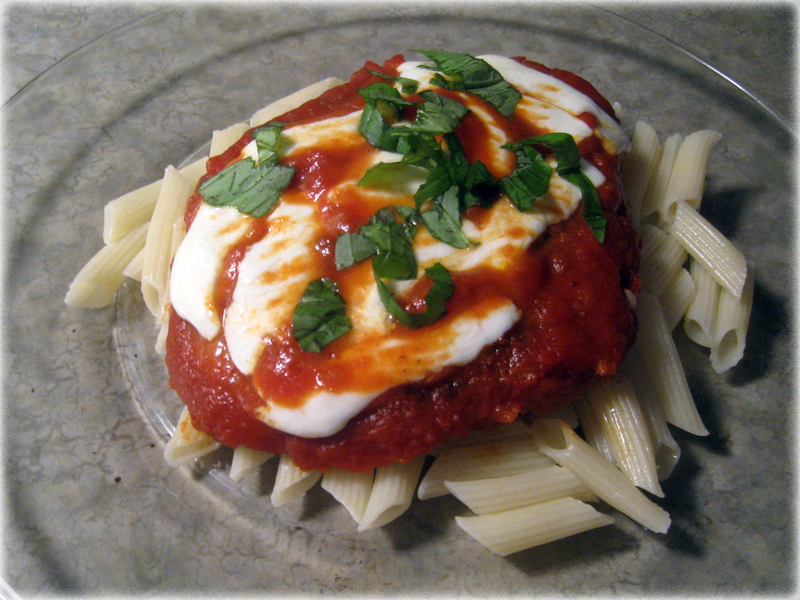 Chicken Parmagiana (or Chicken Parmesan, however you spell it). I love this almost cliché dish. It is the guilty-pleasure touchstone upon which I judge all Italian-American restaurants. If a restaurant can’t make a good chicken parm then there’s something wrong. It’s such a simple dish, but it is definitely one of those comfort foods everyone should have in his/her repertoire. This recipe attempts to minimize some of the caloric impact a meal like this has (despite what the calorie counts below might imply). One of the things I did was I skipped the flour in the breading process because I thought breadcrumbs were enough. I also half-fried the chicken instead of just frying the chicken. By combining a quick fry and then baking, it definitely cut out some of the grease. I have to admit that you do sacrifice a little bit of crispiness when you do this, but it still tastes great. You can also just fry the chicken parm without baking, but that will up the calories quite a bit. You can also just bake this recipe without frying to save even more calories (see bottom of recipe). Makes 3 servings (most standard chicken breast packages come in threes). Check out my small basil plant. Basil on-demand! Note: You can use regular breadcrumbs, but the panko stays much crispier and it absorbs less oil. Note: There is 1/8 cup of oil leftover after frying, so only count 720 cal. towards the total or 240 cal. per piece of chicken. Note: You can also just use shredded skim milk mozzarella if that’s easier. Set the oven to pre-heat to 375 degrees. Lay the chicken out on a cutting board and identify the tenderloin (it’s that small flappy part of the chicken breast that is almost a piece on its own. Cut the tenderloin off of the chicken breast and save for use in something else (they make great chicken fingers). 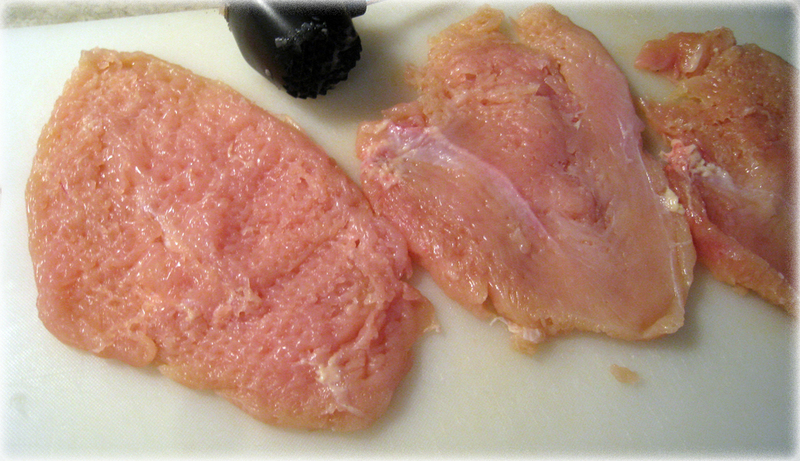 If you buy 1.2 pounds of regular packaged chicken, some of those ounces will be chicken tenderloins. Try Perdue “Perfect Portions” for 5 oz. individually packaged pieces. Next, pound each of the pieces of chicken using the tenderizing mallet to make the chicken larger and thinner. Don’t go overboard or the chicken will be too thin and destroyed. Just pound gently until the chicken is about 1/4 or 1/2 inch thick. Set up your breading stations by cracking an egg into a bowl and scrambling it well. Then dole out 1 cup of seasoned panko breadcrumbs onto a large plate. Note: If you don’t use seasoned panko breadcrumbs then season them with salt, pepper, parsley (or even a little grated Parmesan cheese), and mix well. Dip a piece of chicken into the egg bath (you like that fancy term?) and coat the whole piece. Then roll the egg-coated piece of chicken in the panko breadcrumbs and set aside on a plate. Continue this process for the other pieces of chicken. Place the 1/2 cup of oil into a large frying pan and set the stove for medium-high heat. When the oil starts to shimmer and gets really hot, add the first piece of chicken and fry that side for about 2 -3 minutes until it gets a deep golden brown color. Then flip and brown the other side as well. After browning both sides of the chicken, place the pieces into a baking dish or onto a baking pan (no need to grease the pan/dish if you’ve fried the chicken). Place the chicken into the oven on the middle rack and bake for about 20 min. After 20 min, take the chicken out of the oven and flip each piece over to crisp up the other side as well and place back in the oven for another 5-7 minutes until crisp. While the chicken is finishing up, cut/grate 1 oz. 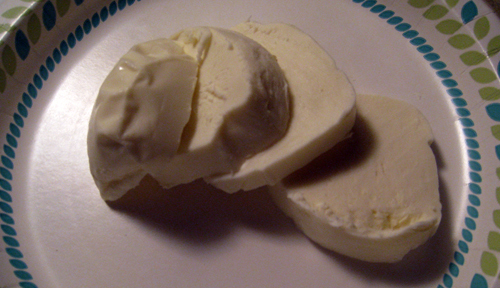 pieces of fresh mozzarella for topping the chicken. Remove the chicken from the oven and top with 1/4 cup (or less) of your favorite marinara sauce. Feel free to also make your own or just use some from a jar. 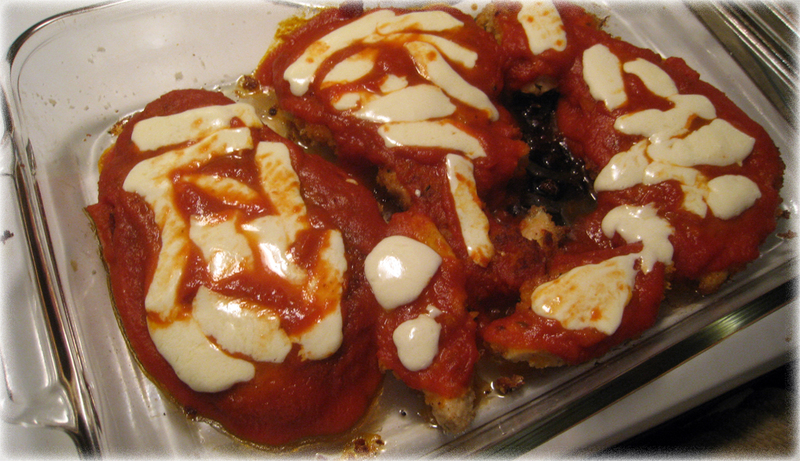 Then lay pieces of fresh mozzarella over the sauce and chicken. Ignore the tenderloins in the baking dish. I just wanted to use them up, so I threw them into the mix. You don’t need to worry about them unless you want to. Then place back in the oven on the top rack and bake for 5-10 min. more until the cheese is melted. If you’re feeling up to it, place the oven on the low broil setting and watch the chicken carefully to quickly melt the cheese (maybe 3-5 minutes). Remove from the oven and let cool for 2 minutes or so. Chop up some fresh basil and place a few pieces on top of the chicken before serving over pasta. Suggestion: Save yourself 240 calories per piece of chicken by just skipping the frying steps (Steps 9-10) and baking the chicken outright. This is admittedly not as flavorful as frying first, but it gets the job done. Just be sure to bake for 30 min. instead of 20 min. Just made this – very yummy! I used plain breadcrumb and added poultry seasoning myself and used shredded mozz instead of fresh.